I have got a treat for you today. 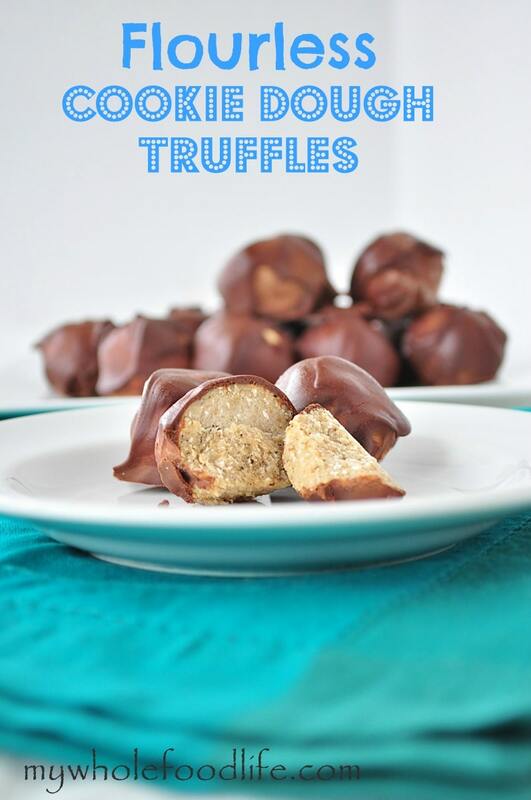 These flourless cookie dough truffles are so good! You will never guess the secret ingredient hiding in this recipe. My kids were totally fooled. Just like they were with my Flourless Peanut Butter Cookies and my Flourless Brownies. These cookie dough truffles are not only flourless, but they are nut free as well! Perfect for kiddos who have nut allergies. These cookie dough truffles are also gluten free. The perfect bite of sweetness with none of the guilt. A sweet treat without the guilt! 2 cups or 1 can chickpeas (If using dried chickpeas , soak overnight and then boil until soft before using.) You can also sub white beans if you wish. In a food processor , grind the chickpeas. Then add in the oats and continue to mix for another minute. Lastly, add in the remaining ingredients for the cookie dough and mix until everything is combined. Roll the mixture into balls, place them on a lined baking sheet and stick them in the freezer for a couple minutes. While the balls are chilling, make the chocolate coating. Using a double boiler, melt the chocolate and milk together while stirring constantly. One the chocolate is melted, roll each ball in the chocolate and place them back on the parchment lined baking sheet. Once all the balls are covered in chocolate, store them in the fridge. They will get way too hard in the freezer. Once all the truffles are coated in chocolate, they will need to chill in the fridge for about 30 minutes to set the chocolate coating. I don't have flax milk. Is there anything else I can use? Thanks Karlijn! So glad you liked them!